Would you pass an opportunity to become rich instantly, with all your dreams and wishes fulfilled for just over a buck. That's the promise modern lotteries offer and it's quite an interesting affair. Singapore has its own Toto, and the most recent jackpot is worth ~$650k SGD ($520k USD). I often see people queuing outside the Singapore Pools, eager to pick their lucky numbers. However, it wasn't the pools that inspired me to dedicate a post entirely on the rationale of lottery buying. Thousands of miles away, something interesting happened on the 30th of March. The MegaMillion Jackpot hit $640 Million, sending US into a lotto buying frenzy. Nearly as many dollars were spent on tickets on the last day alone than what ended up being given away. And the game is pretty simple. You pick 5 numbers between 1-56 and a mega number between 1-46. You win the jackpot when you match all six numbers. After 18 consecutive draws with no winners, the jackpot had accumulated to an all time high of $656 Million, and finally a trio of people picked the right numbers 2, 4, 23, 38, 46 with a Mega Ball of 23, and walked home with around $218 Million (pretax and annuity) each. That's pretty incredible right. Now before you rush out to try your luck in the next lotto, let's evaluate what your chances are, and should you waste your hard earned money on it. We will use the MegaMillion as an example. The incredibly small odds also mean that your chances improve ever so slightly even if you spend 1000s of dollars on picking different numbers. Another thing that people often forget is the final payout. In US, you typically have a 35% federal tax and a state specific tax. In addition, the Jackpot payout is either an annuity over the next 26 years or an upfront cash payment. We know that a $1 is a worth a lot less 26 years from now. The Present value is ~63% of the Jackpot, almost same as the upfront cash payout that Mega Million offers, if you chose to accept it over the annuity. Finally, the pot is split among all the winners, thus your individual share reduces with more winners. Even in a state where there are no state taxes, our 3 winners will eventually take home only $89M (~218 * 63% * 65%) of the initial $218M today. There obviously are other smaller prizes if you match just a few numbers, but I will ignore them in our discussion here. Question is, How do you evaluate whether you should buy into a lottery. Idea is pretty simple. We compare the expected value of a lottery with it's price. If the EVA is equal or greater than the price, we buy it. Below is short video tutorial on what Expected Value is. Assuming If there is only 1 winner of the jackpot, solving the above for EV = 1, will give us a break even Winning Amount of $430 Million Prize Money before you should even consider investing in the lottery. When the jackpot touched $650 Million, the expected value was a cool $1.5. But wait, before you rush out, did I mention there can be more than 1 winner. With each additional winner the pot shrinks and so does the Expected value. To estimate the number of possible winners, let's turn to Poisson distribution. Based on the distribution, there is a 97.5% chance there will be a winner. 9% chance of just 1 winner, 17% chance of 2 winners, 21% chance of 3 winners (actual result), 19% chance of 4 winners and 14% chance of 5 winners. Solving for the above, gives an EVA before tax for annuity at $1.33. Discounting it for the Present Value and taxes gives us just around $0.54, which is clearly less than the price of the ticket ($1). The details of my working are on the google spreadsheet. The EVA of all the other prizes for Mega Million Lottery gives you just an additional ~$0.11. Thus Mega Millions is never a rational decision for most people. You could argue that when you buy a ticket, a few parameters are unknown. For instance, the eventual number of sold tickets. But you could look at the historical data, from places like lottoreport to estimate the future sales. I have never bought a lottery ticket in my life. For me, the ticket price outweighs its expected value and can never be a profitable decision. And it's not just Mega Million. No matter where you are, or which Lotteries you buy, the odds are generally always stacked against you. 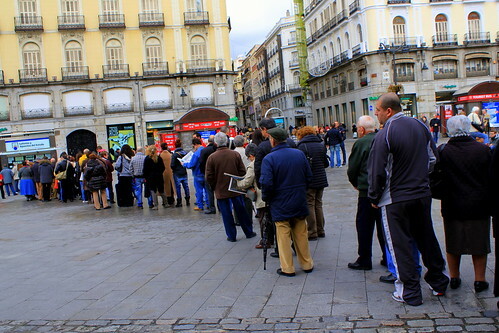 But people still continue to queue, waste their time and hard earned money, week after week, with a hope that it might just be their lucky day. Rationality says NO but decisions are generally driven by emotions. And till then, people will continue buying lottery tickets.